What is a Maryland Month to Month Lease Agreement? 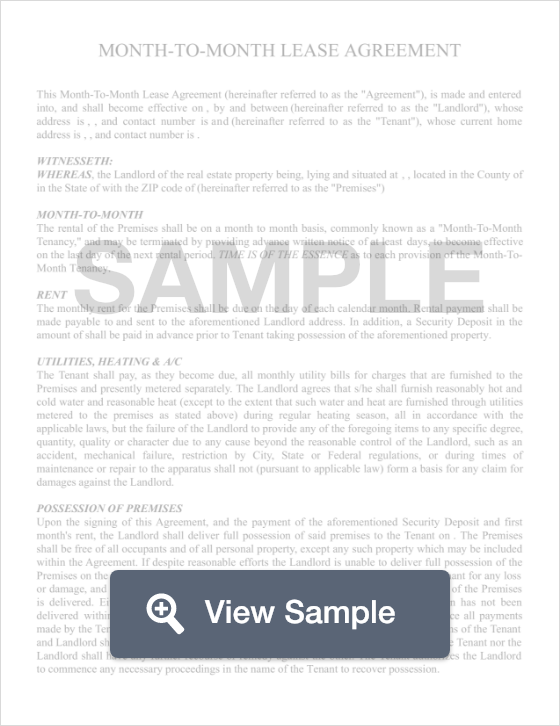 Maryland Month to Month Lease Agreement: What Is It? In Maryland, a month to month lease agreement is a legal contract that landlords use to officiate a lease agreement between them and a tenant. The reason that this type of agreement is called a month to month agreement is that rather than the lease agreement being for a period of 12 months, the lease is only valid for one month. This means that the tenant and landlord are only signing a one-month commitment, and can cancel at any time as long as they give sufficient notice. Month to month lease agreements are just like their long-term counterparts, they outline specific terms of the agreement such as the amount of rent to be paid, due dates, and rules of occupancy. According to tenant laws in the state of Maryland, a landlord or tenant who wishes to terminate a lease must provide at least a 30-day notice. In addition, this notice must be written and delivered to the receiving party at least 30 days before the lease is to be terminated.